Our new lines of Premium embossed machine PET are precision made in Germany with double screw technology, making it split free. The strap end is secured tightly at the end of the roll without tape, to avoid pulling tape into the machine. 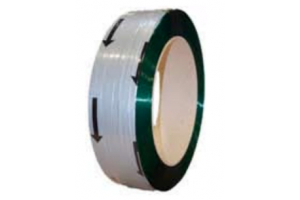 Ultra-smooth PET strapping is highly dense, it offers excellent weldability and is the best strap for heavy applications under high tension and works great on tools with aggressive feed wheels. 16MM X 1000M X 1MM GREEN ULTRA SMOOTH PET STRAPPING is the best strap for heavy applications under high tension and tools with aggressive feedwheels. 19MM X 650M X 1.27MM GREEN ULTRA SMOOTH PET STRAPPING is the best strap for heavy applications under high tension and tools with aggressive feedwheels. 19MM X 800M X 1MM GREEN ULTRA SMOOTH PET STRAPPING is a highly dense and split resistant PET with excellent weld-ability.